As far as cliffhangers are concerned (and depending on how you feel about them), this book has one of the best/worst cliffhangers I have come across in a while. It definitely has me eagerly waiting for the next book! If you are not a fan, I would advise you to wait to read Anew until the sequel is released. While the story itself is amazing, the best part about this book is the characters. The reader cannot help but connect to Scarlet. She has many qualities that I really appreciate in female characters: courage, strength, and the ability to throw some awesome comebacks in a pretty boy’s face. I felt her confusion as she attempts to piece together her past and learn who she is, and I felt her emotional turmoil as she struggled with her growing affection for two brothers. One of the brothers, Gabriel, is an all-around nice guy burdened with a curse that will forever haunt him. His love for Scarlet runs deep and true, and he really cherishes her. Tristan, on the other hand, is the bad boy in their little family. He is dark and mysterious, and even though he hides his true self behind a rough exterior and a mouth that constantly spews insults, he also really cares for Scarlet. (The guy is willing to die to save her from dying again!) He is a tortured soul, never able to have the one thing he wants the most, and my heart goes out to him. (In fact, he reminds me a lot of Will from The Infernal Devices series by Cassandra Clare.) I am definitely rooting for him in this love triangle! I do like Gabriel, but I will always cheer on the dark, tortured man. I guess I am one of the reasons the saying “nice guys finish last” remains true, but I seriously cannot help it! I have to commend Fine for her well-written and well-developed love triangle. Very few love triangles are well done. In fact, most are downright torturous. I still think even good love triangles are emotionally grating and frustrating (usually because the guy I like never ‘wins’ and they are chocked full of drama), but at least the men’s proverbial ego wars are absent. I already mentioned this in my review for Clockwork Prince, but I seriously hate it when men fight over a girl through insulting one another, battles of physical prowess, and other creative ways of trying to claim the girl as their own. I think in this case, these ‘contests’ would have been even worse than usual ones since it is a love triangle that involves brothers (I hate when siblings fight). I like the fact that Fine does not include these unnerving elements in her love triangle. It makes the love triangle more bearable (for me, anyway), and it really improves the story instead of hindering it (*coughWingscough*). 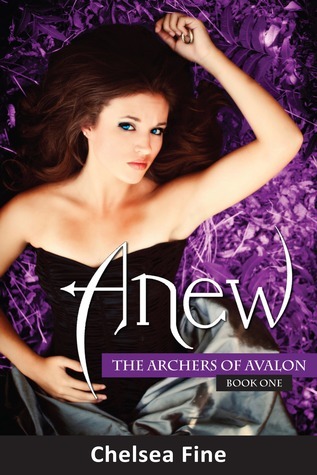 Overall, Anew is a WONDERFUL book, and you should definitely check it out if you haven’t already. I am eagerly anticipating the next book in the series, Awry, which will be released sometime in 2012 (the exact date has yet to be specified). I cannot wait to see what happens after the cliffhanger! The only thing I ask is for, Ms. Fine, is no cliffhanger in the next book! Please! Do not make me summon Conan again (his service fees are ridiculous).